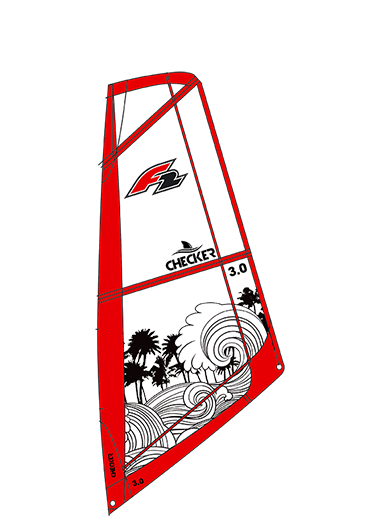 Our F2 Checker is our ultimate Kids sail, equipped with 3 Sailbattens, Dacron Sailcloth, durable monofilm and a cool design. It was important to us that Kids can handle the sail easily, already while rigging, so that the fun begins at the beach. It’s absolutely easy to pull it off the water and it expands an even - easy to control - force. The Checker in sizes 1.5, 2.0, 2.5, 3.0, 3.5 and 4.0 come with a two-part thin Epoxymast, matching vario boom, mast foot adapter, line set and sail sleeve. Sizes 1.5 and 2.5 are supplied with an Alumast, matching boom, mast foot adapter, line set and sail sleeve.